This is a regular event for the Tri-Anglia Wheels Sidecar Club, which is my local club. The campsite is adjacent to the Lincolnshire Aviation Heritage Centre at East Kirkby, near Boston. The Aviation Centre is well worth a visit if only to see ‘Just Jane’, the WW2 Lancaster aeroplane. Luckily the day started dry and stayed that way, although it was a little windy. The lads flying the models reckoned that on the airfield the wind was gusting at 15 to 20mph. I had a nice ride to the campsite, where I met up with other club members. Some of the club members decided to ride to the seaside resort of Skegness and, as it was a Bank Holiday weekend, a map was consulted as to the most traffic-free way to get there. I went along on the Saturday as a day visitor, to catch up with the club members. I then went on to the Aviation Heritage Centre, which was also in full swing, with the Large Model Association (LMA) Air Show – and they’re not kidding about the name; some of these are seriously large models. 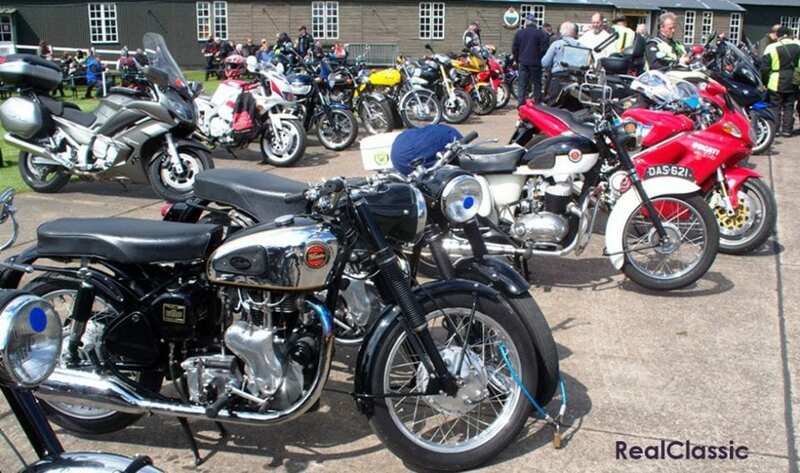 The other good thing about going on the Saturday was that the Wolds Bike Run was also taking place; a 40-plus mile ride through the local area. 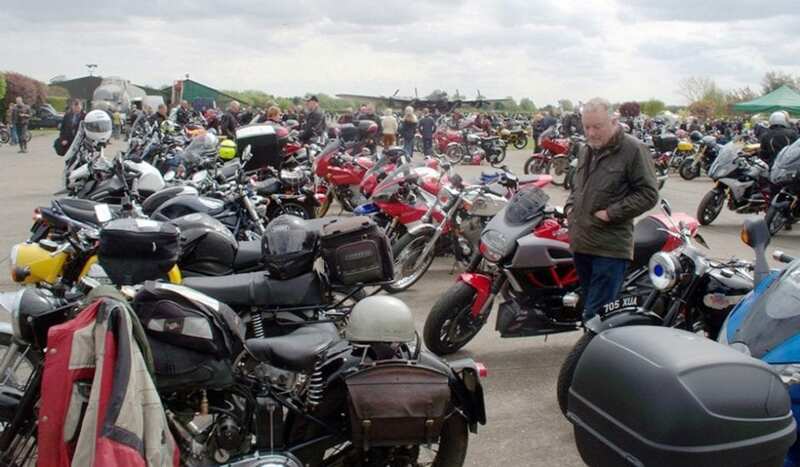 This is organised by the Skellingthorpe Motorcycle Club. To join in the run you can download an application form from their website, or you can sign up on the day. One rider who had just signed on went back to his Norton Commando and gave it a few healthy kicks, unfortunately to no avail. 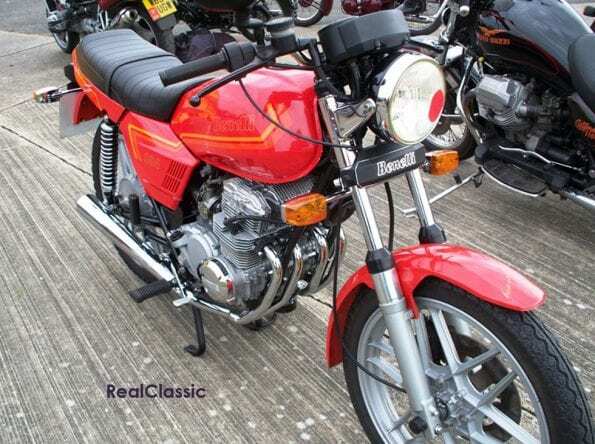 He then decided to use the electric starter – this did the trick with a nice burble coming from the exhausts as he rode off to join the next group to start the ride. This event attracts lots of riders and lots of machines of all ages, with plenty to see and do. 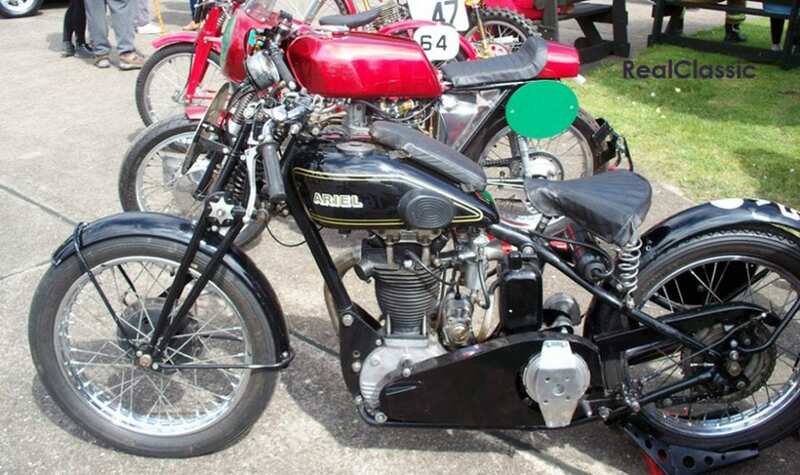 A 1930s girder-forked Black Ariel, a mist-green Sunbeam twin, a smart and fast Benelli four and a postwar sporting Velocette single were just a few of the interesting machines you could admire. There were stands catering for the needs of the model flyers as well as craft stands. Luckily I managed to picked up a couple of bits that I needed here. A wartime Jeep was doing short tours around the airfield – this went to areas that you do not usually see. The Heritage Centre had all their food outlets going at full speed, and the airfield and museum were heaving. The Lancaster has just been partially overhauled, and has just been repainted after a down-to-bare-metal strip-down. This was only recently finished, and then they had to check the engines over. One of the staff said that the midnight oil was burned getting the plane ready in time for the weekend. The sound of the four Merlins starting up is magic. The plane does taxi rides and at the end of the ride the pilot gives the engines a good rev – they sound sweet! If you get lucky you might win a raffle prize – the main prize of which was a taxi ride in the plane. A large group of BSA riders followed each other in, which was nice to see. 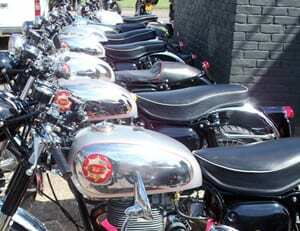 With so many motorcycles here you were bound to meet some friends, but one BSA Bantam fan was disappointed that he had failed to spot any. Something different this year was when a dozen cars from the National Street Rod Association pulled in; these were also well worth a look, as was the selection of bikes to look at. The LMA kept up an excellent show during day. The Fokker Tri-plane was very good, as were several biplanes. At the opposite end of the scale there were some very quick jet planes, the skill of the flyers was outstanding. An amazing display. This is a brilliant day, with plenty to see and do. The staff at the centre were very busy. I will be back next year as it is well worth a visit.